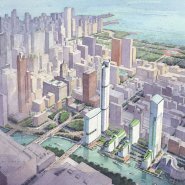 Franklin Point was designed as a large-scale mixed-use development along the Chicago River just south of the Loop. 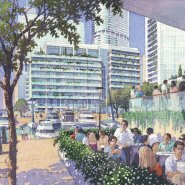 The development, which includes two new harbors, would bring 5 million square-feet of new space to the South Loop area. 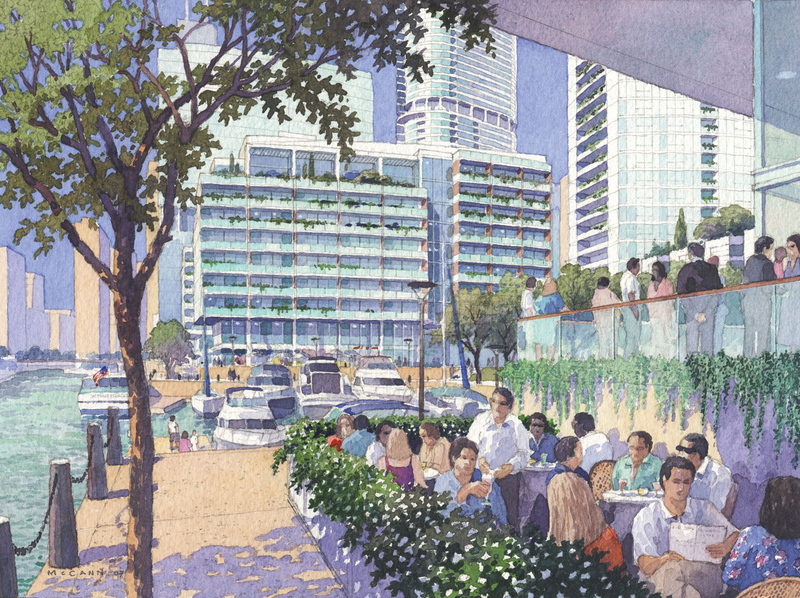 Franklin Point is a vibrant, highly sustainable urban development plan that enlivens the Chicago riverfront and creates value to the public and inhabitants alike. The plan consists of 5 million sf of programmed space. It is comprised of eight buildings. The development features a diverse mix of condominiums and townhouses, apartments and senior housing, a 500-room hotel, and 125,000 square feet of retail space. Landscaped parks, streetscapes and a river walk are planned for the development, as is a marina with room for 40 boat slips. Highlights of the urban plan include remediation of the brownfield site that was formerly an old rail yard. 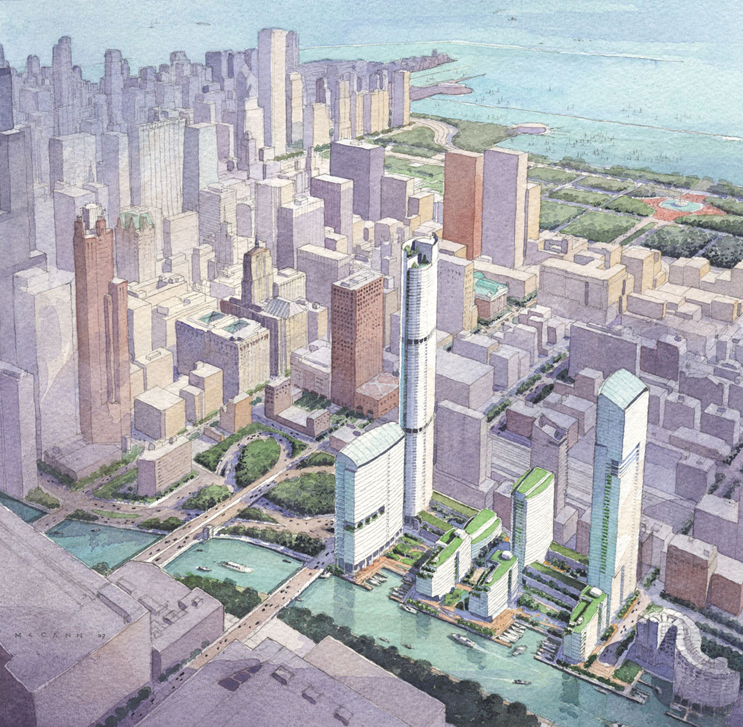 The site is in a prime urban location close to the core of Chicago’s Loop with access to a variety of forms of transportation, including river taxi, commuter rail, bus, bicycle and pedestrian paths. Urban densification is also a major goal of the project. This densification has the goal of protecting the local ecology and promoting urbanization as a means of reducing a community’s ecological footprint. The project will increase density throughout the city, leading to the elimination of unnecessary car trips, increases in local services and amenities and other local economic development. These all play a role in reducing carbon emissions. Combining this densification with the site’s integration of public and private spaces along the river walk and bicycle path will help to revitalize this underdeveloped river front property. Retail is integrated into these public spaces. Water elements included in the public space design provided cooling in the summer and humidification in the colder months as well as creating a sound buffer. Townhouses are programmed at the podium level to break down the scale of the development to a smaller, walkable neighborhood scale. The buildings are placed to ensure that access to daylight and views will be unobstructed to as many inhabitants as possible while still reducing solar heat gain in the summer and heat loss in the winter, to reduce overall energy consumption. Other sustainable strategies included green roofs and photovoltaic systems on all roof planes. An innovative air cooling system will allow preconditioned cool air from the unused existing freight tunnels to supplement the cooling system. This will be used in combination with the Chicago River water and a geothermal field for pre-heating and cooling the remainder of the project. This will be connected to the residential units’ closed-loop active slab system.